The Conservative Party was the name commonly applied to a loose political organization that first developed in North Carolina during the Civil War, when the old Whig and Democratic Parties ceased to function as separate political entities. A Whig-Unionist coalition evolved in opposition to a Democratic-Secessionist group that came to be called the Confederate Party. After the war there was a further realignment of old-line Whigs with Democrats, called Conservatives to distinguish them from the Radical or Republican Party. North Carolina was a late adherent to the cause of secession, and its Unionist Whigs remained strong. In 1862 the Confederate Party candidate for governor, William J. Johnston of Charlotte, was easily defeated by the Conservative nominee, former Whig congressman Zebulon B. Vance of Buncombe County. The vote of 55,282 to 20,813 was a notable repudiation of the secession Democrats. During the campaign, William W. Holden, Democratic editor of the North Carolina Standard, was a Vance partisan. 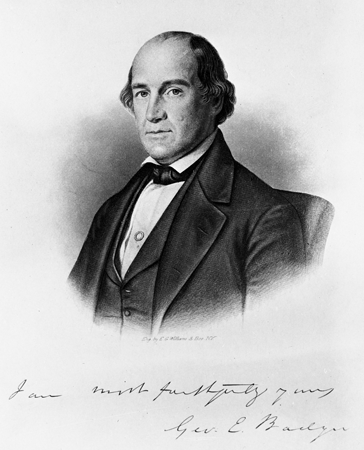 Despite Holden's endorsement, the Conservative Party was dominated by former Whigs, including former senator William A. Graham, Senator George E. Badger, state treasurer and future governor Jonathan Worth, and others. Two years later Vance beat back a challenge by Holden, who ran as the "peace candidate," by a vote of 58,070 to 14,491. Vance's party, while supporting the war effort, basically advocated state rights and vigorously opposed encroachments on civil liberties by the Confederate government in Richmond. In May 1865 the first incarnation of Conservatives in North Carolina effectively ended when Vance was arrested by Federal troops. Under the presidential plan of Reconstruction, President Andrew Johnson then appointed Holden provisional governor on 29 May. Holden was soon turned out of office by a Conservative coalition supporting Worth. A Conservative-dominated constitutional convention held in October 1865 and May-June 1866 nullified the ordinance of secession, abolished slavery, and repudiated the Confederate debt but declined to give blacks the vote. The proposed constitution failed to win voter approval. In 1866 the General Assembly adopted a "black code" expanding the civil rights of blacks but refusing to give them political rights. In 1867 the U.S. Congress took over Reconstruction with the passage of a series of Reconstruction Acts, and the state Republican Party was organized around support for Congressional Reconstruction. The confused and discouraged Conservatives, some disfranchised by Congress, were united only by their opposition to Radical Republicanism. At a new convention election in November 1867, the Republicans prevailed with 107 delegates, as opposed to only 13 for the poorly organized Conservatives. The constitution drawn up by the convention in February 1868 was a liberal document modeled after northern state constitutions. At the same time, the Conservative Party held its own convention; chaired by William A. Graham, it denounced Radical Reconstruction. In April 1868 the new constitution was ratified by a vote of 93,084 to 74,015, and William W. Holden was elected the first Republican governor. The legislature was solidly Republican. Over the next two years the Conservative Party, which to that point had been more of a coalition than a party, organized to defeat the Republicans. The party campaigned on three major issues: white supremacy, economy in government, and opposition to the Constitution of 1868. In the legislative elections of 1870, the Conservatives were swept into power. They impeached Holden, who had been overly vigorous in his pursuit of the Ku Klux Klan. They scaled back state expenditures, including education, and set up the Shipp Commission to investigate Republican frauds. In 1876, with the likely victory of their nominee for governor, Zebulon B. Vance, and the possible election of Democratic presidential candidate Samuel J. Tilden, they dropped the term "Conservative" to officially become the Democratic Party of North Carolina. Between 1870 and 1879 the Conservatives achieved most of their main goals. They reduced state expenditures by scaling back the state debt, closing the University of North Carolina (1871-75), and reducing the budget in general. Through a constitutional convention in 1875, they revised the existing state constitution to eliminate Republican and black county officials and strengthen the electoral stranglehold of the Democratic Party. Because of its pro-business attitude, the party was backed by emerging southern business interests. The impact of the Conservative Party on North Carolina politics was significant and long lasting. John L. Cheney, ed., North Carolina Government, 1585-1979: A Narrative and Statistical History (1981). Engraving of George E. Badger with facsimile autograph, by E.G.Williams and Bro., New York. Image from the State Archives of North Carolina. Call number N_58_6_7.